I can offer a full supply and fit fencing service. A sturdy wooden fence is a necessity when it comes to gardens, so get in touch if yours needs repairing or replacing. Many people just don't have time to keep their garden looking its best all year round. 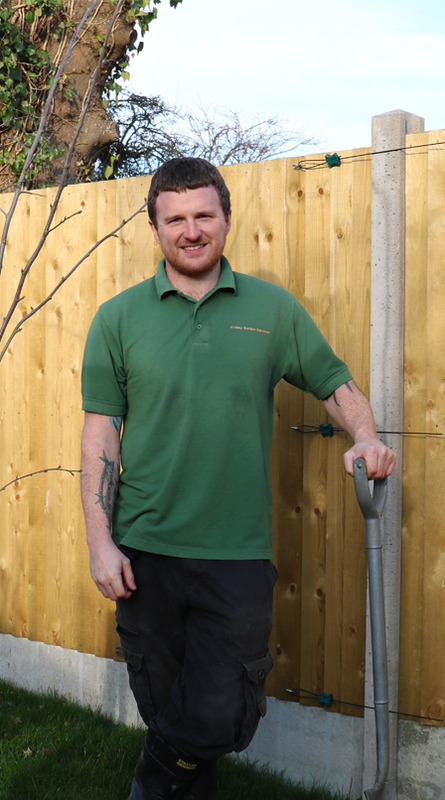 Whether you need a one-off job or ongoing, regular maintenance services, I can do all the hard work that is normally involved in keeping it looking at its best - from re-turfing to fencing, installing water features to pruning and advising you how to grow your own produce, I can help. Being fully trained & certified in chainsaw use (CS30), I can tackle any of the difficult jobs associated with clearing old trees or other large plants. I am fully trained and licensed to use pesticide sprays to help with weed and bug control (PA1 & PA6), so can help to keep you garden looking at its best. Patio or decking not looking at their best? I will clean these or any other outdoor surface around your property by jet washing, bringing you long-lasting outstanding results. As well as providing regular grass cutting I can also offer lawn treatments including scarifying, autumn feed, spring feed, weed & moss killer, and turf laying. I am also continuing to manage other large private estates on a part time basis, and doing work for local churches too. I have also previously worked for Medway Council where I was responsible for the upkeep of the green areas around Medway. I really enjoy doing any gardening/grounds maintenance work, and take great pride in the work I do and strive to get my work to the highest standard possible. I am also very hard-working, reliable and trustworthy, and you can count on me to deliver on your requirements. Hi fridaygardenservices.co.uk Grow your bitcoins by 10% per 2 days. Profit comes to your btc wallet automatically. Try http://bm-syst.xyz it takes 2 minutes only and let your btc works for you! Guaranteed by the blockchain technology! Andy works hard and is an all round good egg.